Before I go any further, I need to say something about safety. This won't apply so much to adults, but younger modellers do please take note of the following; take very great care when using a craft knife. ALWAYS cut away from your fingers, and if necessary have an adult with you. Always use a SHARP blade, as it is less likely to slip and also, should the worst happen, it will result in a clean cut that heals quicker. A blunt blade will result in a jagged cut that takes longer to heal. I know this from very painfull personal experience! Rule number one; follow the instructions carefully, checking the number and orientation of each part. Pay particular attention to the orientation of tank wheels and tracks, these are quite easy to get wrong, so be carefull! 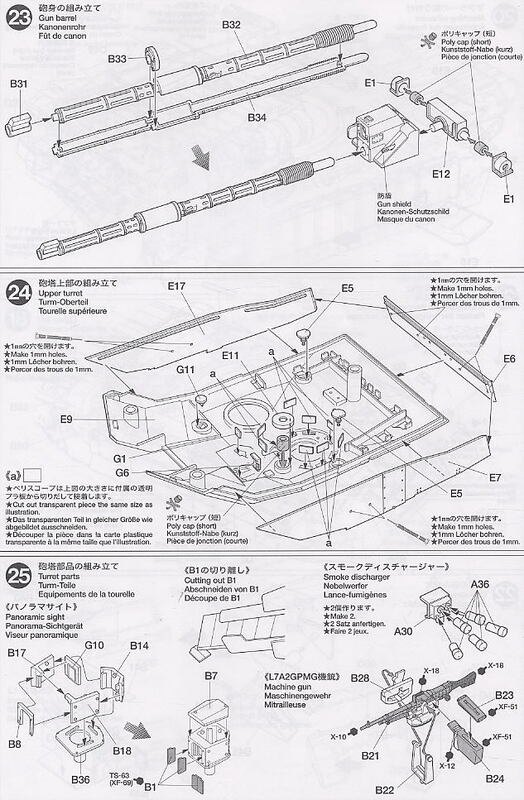 An example of Tamiya's well laid out, easy to follow instructions. Rule number two, this follows on from rule number one. Take your time, don't rush into it. This goes back to being properly organised, if you take the time to properly organise yourself, the chances are you'll be more inclined to take your time actually building the model as well. Rule number three, use glue SPARINGLY, this helps to avoid those dreaded 'glue fingerprints' I mentioned in a previous post. Don't be afraid to try using different types of glue as well. Poystyrene Cement is the most commonly used glue for plastic models and is perfectly fine for this, but it is rather slow setting. This has implications for holding small parts in place while the glue sets. Think about using quick setting superglue for small parts, and Polystyrene Cement for the rest. It's a method that has worked well for me over the years, however, do make sure you use a good quality superglue. Also the USE SPARINGLY rule really does come into play when using superglue. For one, using a lot of superglue can cause 'fogging', a white film that is caused by the superglue's fumes (we've all seen CSI on the TV where they use superglue fumes to bring up fingerprints! The same principle applies here.). This brings me nicely to my next point, ALWAYS build your model in a well ventilated room, glue fumes can be nasty in an enclosed space. Rule number four, handle small parts with care. I know this sounds obvious, but I've lost count of the amount of times I've accidentaly snapped a small part before I've been able to glue it in place! 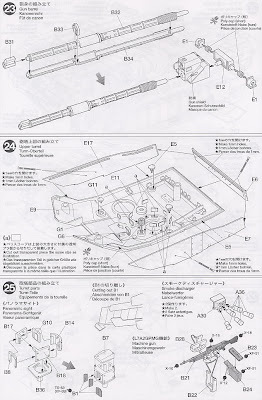 These are the four most important things to remember when building a model kit. There are however a number of other usefull tips and tricks that I'd like to share with you. When glueing a long seam e.g. two halves of an aircraft fuselage, don't use glue straight from a tube or other container, apply it with an old brush instead. This saves you from having dribbles of glue running over the parts you're attaching together. An alternative is to use a bottle of Liquid Polystyrene which comes with an applicator brush. If you do apply too much glue by mistake, wipe off the excess with a damp cloth straight away. Polystyrene Cement works by partly dissolving the two parts where the glue has been applied, so if you don't wipe off the excess glue straight away, you are left with a small 'pit' where the plastic has been dissolved. If this happens you need to fill this pit with a small amount of filler. I recommend using a two part epoxy type filler, such as Milliput. Another tip I have learnt is this; when glueing small parts, instead of applying glue straight from the tube, pour a small amount into a dish. Then, whilst holding the part with tweezers, dip the part into the glue in the dish then fix the part to the model. This helps to prevent using too much glue. Go through a 'Dry Run' with parts before glueing them, this way you know exactly how the parts fit together before permanently attaching them, and mistakes are less likely to occur. When glueing headlight lenses, don't use Polystyrene Cement, as it can fog up the lens. What I do is use PVA glue, this dries clear and more importantly, doesn't fog up the lens. To make a small M.G. look more realistic, dab a tiny dot of matt black paint on the end of the gun barrell to make it look like it's been bored out. For larger Tank gun barrells etc, I carefully drill them out with my Collett Chuck! In fact my 25 Pounder Gun's barrell has been bored out its full length, from breech to muzzle, using this method! However, if you are going to do this, you must put glue along the full length of one of the barrell halves' edges. This is because when you drill the barrell out, you are drilling through the locating pegs and holes that you have glued inside the barrell, this obviously takes out that joint, so the barrell needs the glue along the edges to hold it together! To create the track sagging effect on German WW2 tanks and Russian post war tanks, wedge pieces of tissue paper between the top of the track and the sponson plate, then paint the tissue the same colour as the tank hull to disguise it. To bend a solid plastic tow cable to fit around a tank's turret or hull rear, heat it gently with a hair dryer to soften it, form it to shape in place on the tank, let it cool, then glue it in place. This next tip is for the more advanced modellers. If you want more realism in your model, look for photographs of the real thing. Have a look and see if anything has been missed out, e.g. wires for headlights, padlocks or straps for stowage bins etc. Adding those extra small details really add to the overall look of the model and there are plenty of aftermarket add-on suppliers out there that make things like etched metal detail sets.